Briefly: Maybe first impressions, plans and opinions aren’t the truth. Gwen’s family has lived on Seashell Island ever since her grandfather opened the local eatery, Castle’s. Her entire family has served the local summer crowd for decades, and they haven’t much to show for it. Gwen is determined to get away, but there’s one thing she can’t escape from: her reputation. Cassidy Somers is the son of a successful boat builder, but he and his best friend were ousted from the local prep school and forced to attend the local high school when the prep school grew weary of their antics. Now his dad wants him to learn his lesson by forcing him to be a yard boy all summer. Cliques collide in this story of self-worth, forgiveness, and the price of dreams. Didja Like It? : I am a big fan of Ms. Fitzpatrick’s writing. Her previous book, My Life Next Door, was fabulous. She certainly doesn’t disappoint in this follow up about a girl whose family caters to the “summer people” who come to their island to play idly in the sand. The secondary storylines are well-crafted and interesting, involving Gwen’s divorced parents, her grandfather, the long-time relationship between her two best friends and the elderly lady she has been paid to take care of. All stories wind around each other intricately and cause the story to be complex and feel true. To Read or Not To Read: Of course! Who doesn’t like sand, ocean, blue skies and beach parties? Who doesn’t like complications, feels, resolutions and grace? 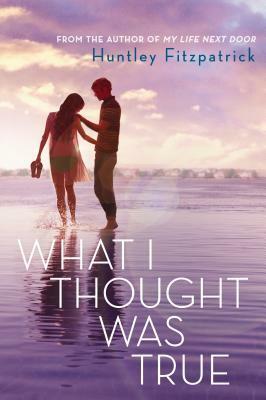 What I Thought Was True by Huntley Fitzpatrick was published April 15, 2014 by Dial Books for Young Readers. Ink and Page picked this book up from the library. I just can’t decide if I want to read this. I did read My Life Next Door, and I liked it, but I wasn’t in love like so many people. But I do keep hearing great things. I should probably give it a try. This story is different from MLND – it’s not like the author has one story and has just changed the names and the setting. There’s a little more shade to WITWT, if that makes sense? Let me know if you do read it & what you think. I’m glad that you enjoyed this one! I didn’t really like it so much but it’s great to see that some people liked this new one from Huntley Fitzpatrick, who definitely deserves an award for her greatness. Awesome review! Thanks so much for the comment. It was a little different than the first, for sure, but I did enjoy it (maybe for that very reason! ).